Welcome to Timpson, Texas ! Frontier Park is an Recreational Vehicle (RV Park), parking facility. Pull through spaces with 20, 30 and 50 amp hook-ups. No deposit, required for Daily and Weekly visits. The Monthly Plan has a Deposit associated with it for Utilities. There is "local police" "security monitoring" periodically on the premises. 12' x 15' open air covered spaces, with electrical outlets and restroom access. ( at a rate of $10.00 per day ). 5 'x 10', 10' x 10', 10' x 15' and 10' x 20' enclosed spaces. Frontier RV "Park" and Campground is located on US Highway 59, in what is referred to as "Deep East Texas", approximately 2 miles south of Timpson, Texas. Timpson, Texas is located approximately 170 miles north of Houston, Texas, on US Highway 59, and approximately 170 miles east of Dallas, Texas, to Longview, Texas, or approximately 55 miles to Marshall, Texas, on Interstate 20. From Longview, travel approximately 60 miles, US Highway 259 to Kilgore, and continue on US Highway 259 to Mt. Enterprise, and the east on US Highway 84, to US Highway 59, and then south 2 miles to location on the right. From Marshall, travel approximately 30 miles to Carthage, Texas, and then an additional 20 miles to Timpson, through Tenaha, all on US Highway 59. 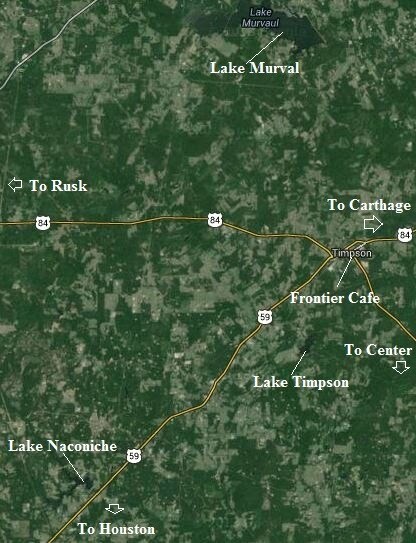 We are located on US 59 (future I-69), and are near 3 large lakes; Lake Timpson, Lake Murvaul and Lake Naconiche. 24 hour phone assistance, and occasional Law Enforcement patrol.